all that will be heard and conveys its musical truth. but utilizing a different tube and a less exotic power supply. 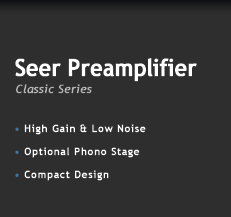 popular used with solid-state power amplifiers. a non-magnetic back-panel for minimum interference. types and medium to high output moving coil types. the listener with a credible vinyl replay performance. tube preamplifiers in this price range. from solid 6mm aluminium billet with a brushed anodised finish. with Line or Phono sources in any hi-fi system.